I remember the room, as if I’m standing in it right now. The window filled wall, with sun beaming in. The sewing machine topped tables, lining the walls. The little “u” shaped kitchen. Two stoves. One sink. Stacks of plates. Large tables to dine at. This was our home economics classroom. This is where I learned my first, basic recipes…including how to make toad in a hole. Toad in a hole. Toad in the hole. Eggs in a basket. Hen in a nest. 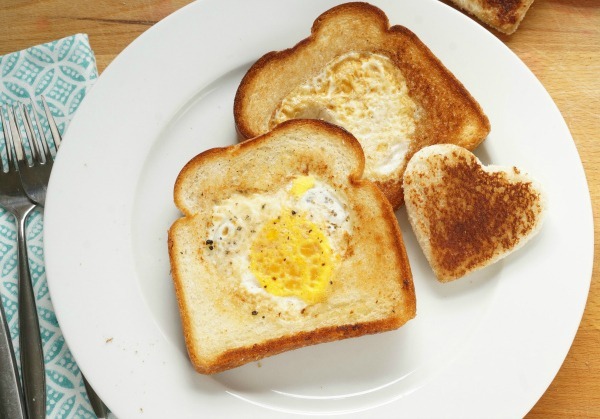 What do you call the simple breakfast dish where a fresh egg is baked inside a slice of bread? Whatever you call it, there is no denying that this is a great starter recipe for kids. 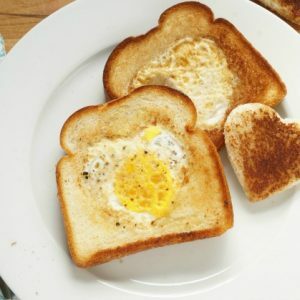 It’s like magic how the egg stays contained inside the slice of bread – it seems almost impossible. With a side of fruit salad, this rustic dish makes for a balanced, healthy meal. This is a recipe that a kids build not only their skills, but their understanding of healthy eating, on. Depending on the age of your child, they can take on making the entire dish, or simply play the role of the observer. 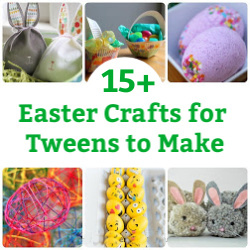 At a minimum, let your child crack the egg…what kid doesn’t love cracking an egg? 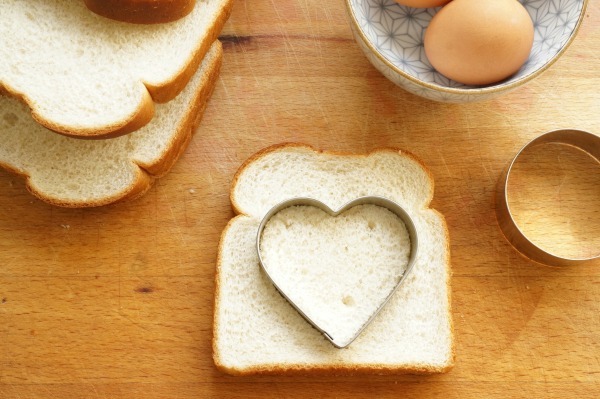 Use a cookie cutter to cut a hole in the middle of the bread. 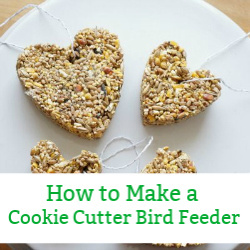 Use any cookie cutter that you like. 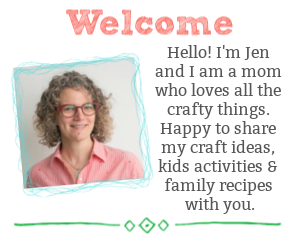 Have fun with a silly shape or stick to a traditional circle. 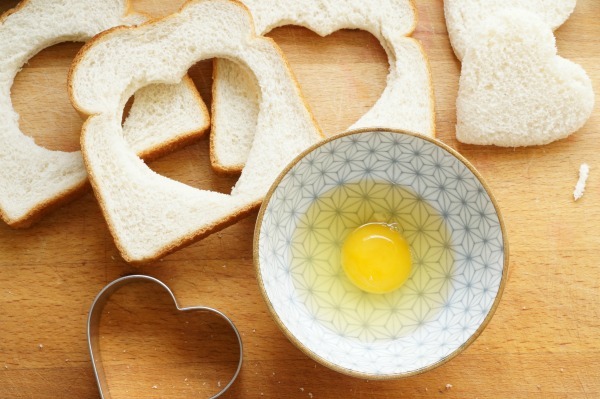 Be certain that the cookie cutter doesn’t cut into the crust of the bread or the egg will leak out. Crack one egg into a small bowl. Cracking the egg into a bowl, and not directly into the pan, is a little trick that ensures you don’t get any broken egg shells in your finished dish. 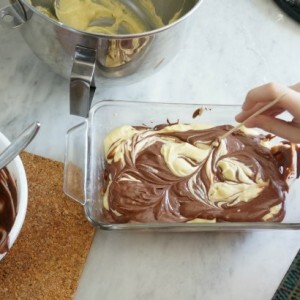 Melt butter in a small skillet, over medium-high heat. 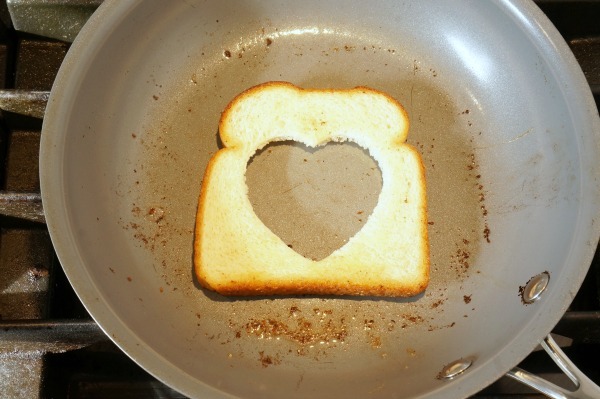 Once the butter has melted, place the bread into the pan. Let the bread toast for a moment. Pour the egg into the open space in the bread. Be careful not to break the yolk. Let the egg cook until it changes from being transluscent to opaque. If you like your eggs “sunny side up” then serve your egg now. 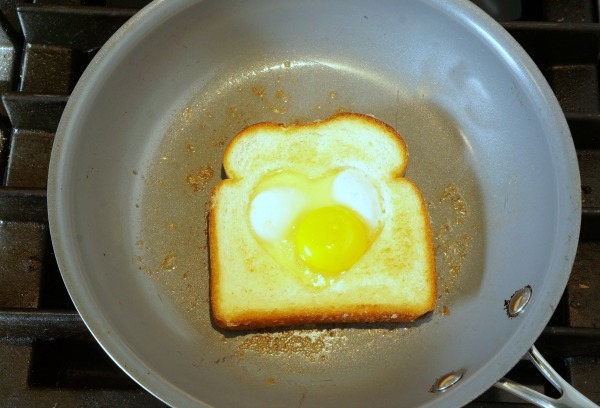 If you prefer your eggs “over easy”, flip the toast and egg over, continue to cook for another 30 seconds. 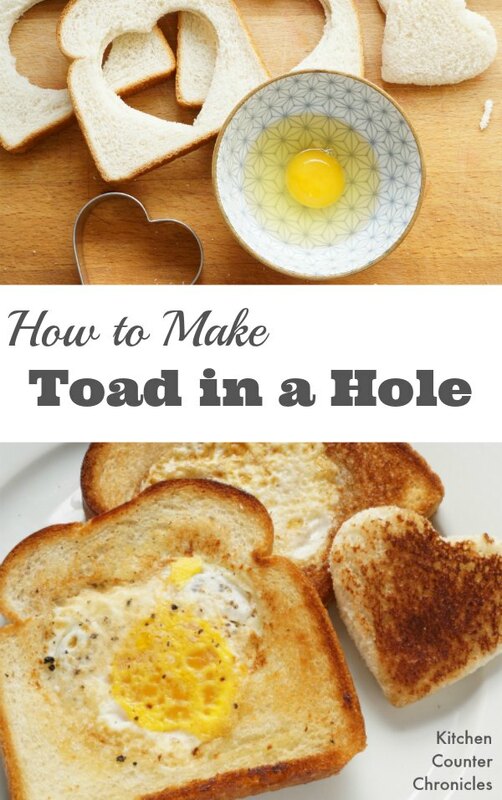 Transfer the toad in the hole to the plate. 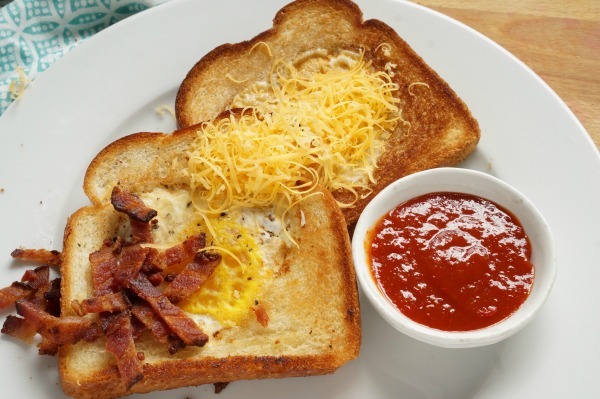 Serve topped with shredded cheese, chopped bacon or siracha. Sitting down at the big table in my home economics class, with a plate of food that I had made was a truly proud moment. It is always a proud mom moment when sit down at our dining room table and enjoy a dish that my girls have made. It honour of my home economics teacher I must speak about kitchen safety. Working around the stove requires more awareness. We have a gas stove, which means that we always wear clothing with tight cuffs, loose cuffs are dangerous around an open flame. Also, always be aware of the handle on the pan. Be sure to tuck it to the side, so no one bumps into the handle and knocks it off the stove. 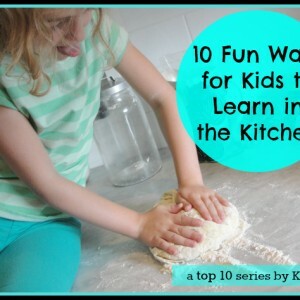 Safety awareness and education in the kitchen helps builds children’s comfort and confidence. Enjoy. 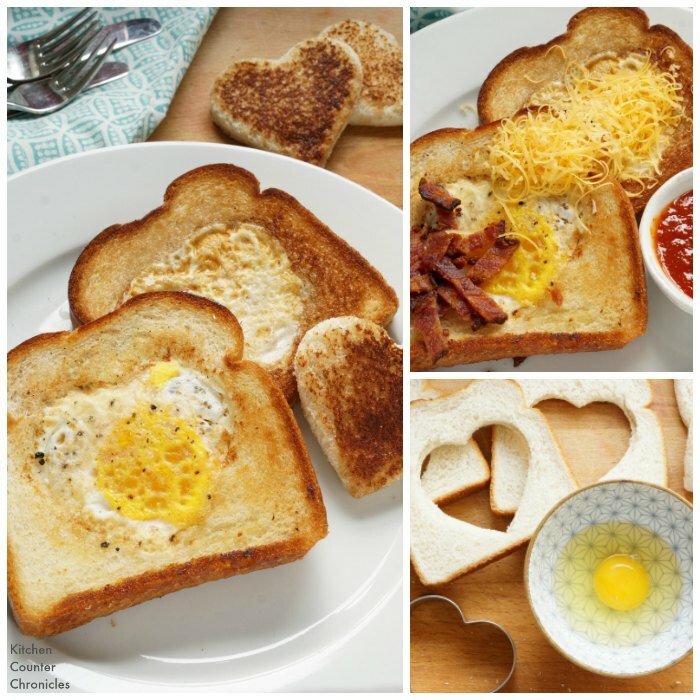 Toad in a hole is a simple recipe that anyone can make - perfect for beginners and kids in the kitchen.